Tanya Wills is a Toronto based Jazz singer. 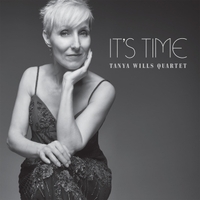 With the TANYA WILLS QUARTET she brings her sensual and evocative sound to this album with three of her favourite gentlemen – master musicians, Bill Bridges, Jordan Klapman and Ron Johnston. Tanya’s repertoire ranges from European Cabaret, to the Great American Songbook to contemporary pieces, including original works.